The library welcomes input from the community concerning the collection. All suggestions for purchase are evaluated using the same selections criteria as for other materials and are not automatically added to the collection. Have you checked our Library of Things or catalog to see if Cary Library already owns this item? How did you find out about this item? Please enter contact information in case we have questions about your suggestion. 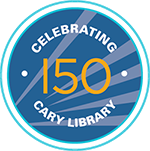 Enter your Cary Library card number. We will place a hold for you if we add the item to the collection.